The difference between mediation and arbitration lies in the nature of the judgement taken by the experts. While the decision taken by the arbitrator is binding on the parties, the mediator does not make the judgement but helps the parties in arriving at an agreement. The occurrence of the dispute is very common in every field not only in business, especially when the issue is related to an opinion, unanimous agreement of the parties is rare. There are various alternatives of dispute settlement, like conciliation, mediation, arbitration, adjudication, collective bargaining and so on. Of these, mediation and arbitration are two processes which are employed in lieu of litigation process, so as to resolve conflicts between the parties. Meaning Mediation refers to a process of resolving disputes wherein an independent third party, assist the parties involved in arriving at solution, agreeable to all. Arbitration is a substitute of public trial, with no need of going court, wherein an independent third party analyses the entire situation and makes a decision binding on the parties. Private communication Meeting between the parties concerned and the counsel takes place jointly and separately. Only evidentiary hearings, no private meetings with the arbitrator. Outcome May or may not be reached. Definitely reached. Decision The mediator does not pass any judgement, but makes settlement only with the approval of parties. The decision of the arbitrator is final and binding upon the parties. Conclusion When the agreement is reached or parties are deadlocked. When the decision is handed down. Mediation is described as a method of dispute settlement, wherein the parties need not go to the court, for a solution, rather an informal meeting takes place in which neutral third party, i.e. mediator, helps them to arrive at a decision, accepted to both the parties. Each and every participant is said to take an active part in the hearing. Further, the process is a confidential one, in which the details of the discussion are not revealed to any other person, outside the hearing. The mediator, is independent, does not pass any judgement or give guidance, but build consensus between the parties concerned, through communication and negotiation techniques. He/She plays the role of a facilitator, by encouraging interaction between the parties. The process aims at arriving at a decision, which is agreeable to both the parties. In case, the mediation does not result in any agreement; then the parties can resort to arbitration or litigation. Arbitration implies a procedure in which an independent third party studies the dispute in detail, listens the parties involved, obtains relevant information and then takes a decision which is considered final and binding on the parties. It is a formal meeting, which begins as a claim and ultimately the dispute is submitted to one or panel of arbitrators, who makes the judgment after taking into account all facts and evidences relating to the dispute. The process is much like a court room proceeding; it is a private trial wherein the dispute is settled outside the court. The parties provide testimony, the third party looks after evidence and impose a decision which binds both the parties and is legally enforceable. A process of conflict settlement wherein an independent third party, assist the parties involved in arriving at decision, agreeable to all, is known as mediation. Arbitration is a private trial, wherein a rational third party analyse the dispute, hears the parties involved, gathers facts and pass on decision. Mediation is collaborative, i.e. where two parties work together to arrive at a decision. Arbitration is adversarial in nature. The process of mediation is a bit informal while Arbitration is a formal process, which is much like a court room proceeding. In mediation, the third party plays the role of facilitator, so as to facilitate negotiation. On the contrary, the arbitrator plays the role of a judge to render a decision. There can only be one mediator, in the mediation. As against this, multiple arbitrators or panel of arbitrators can be there in arbitration. In mediation, along with the joint meetings, the mediators hears both the parties in the private meeting. On the flip side, in arbitration, the arbitrator remains neutral, and no such private communication takes place. Thus the judgement is based on evidentiary hearings. The parties concerned, have entire control on the mediation process and the outcome. Unlike, arbitration, where the arbitrators have full control on the process and the outcome. 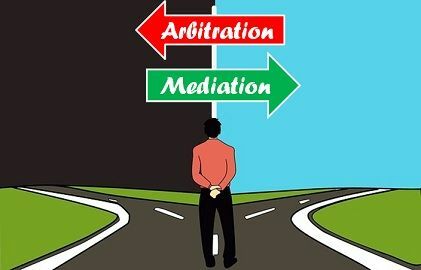 The outcome in mediation relies on the needs, rights and interest of the parties, whereas, the decision of arbitration depends on the facts and evidence presented before the arbitrator. Mediation may or may not result in a solution, but arbitration definitely finds a solution to the matter. The mediator does not pass any kind of judgement rather makes settlement only with the approval of parties. As opposed arbitration, the decision taken by the arbitrator is final and binding upon the parties. The mediation process is ended when the agreement is reached, or parties are deadlocked. The arbitration is concluded when the decision is handed down. Both the processes can be voluntary or compulsory; wherein the third party need not be trained. Choosing between the two alternatives is very confusing and tedious task because both have their pros and cons. Mediation ensures confidentiality but the does not guarantee the attainment of the outcome. In contrast, arbitration gives guaranteed result, but the confidentiality of the matter is at stake and at the same time the cost of arbitration is greater than mediation. So, before opting any of the two processes, first identify your requirements, suitability and the worth of the decison. Only then you will make a right choice of process for the dispute.